You don't typically see quarter round on stairs to hide gaps. If someone tells you that's how they do it, just say thanks but no thanks. Many do it yourselfers may not want to take on this task. But for the ones that want to, I am going to describe in detail how to install laminate flooring and hardwood on stairs. What I am describing here is installing laminate or hardwood flooring on the stairs. This is not the same as installing solid stair treads. This can also apply to a step down like a sunken living room. The key when installing laminate on stairs is to take your time. Your objective is to get all the pieces cut to the right length, so they fit tight on both sides. Here is an example of a bad laminate installation on stairs. The other important factor is to get your stair noses level. This requires a lot of attention when cutting the risers as they support the stair nose. 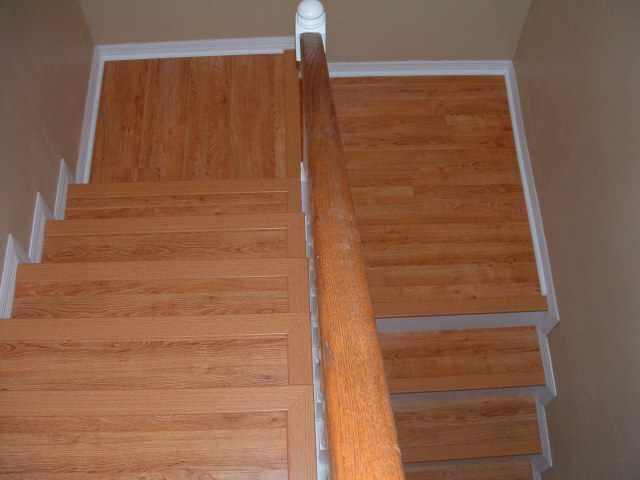 Here I describe how to install laminate or hardwood on a straight flight of stairs that may even have a landing. Here is my method for installing laminate on angled stairs. How to install laminate in a sunken room. Installing laminate on top stair to carpet. Although some of the laminate flooring manufacturers are developing a stair nose that is flush with the laminate tread. This new type of stair nose I saw is made of metal with the wood grain to match the flooring. Here is a list of the basic stair components that make up the staircase. The TREAD which is the actual part of the stair you step on. The RISER is the vertical part of the stair that rises from the tread up to the stair nose. The STRINGER is the board that is on the wall , it runs up the length of the staircase. The STAIR NOSE may not always be present on your existing stairs. We will be installing new stair nose. The stair nose will be installed at the top of the riser where it meets the tread. The preparation can vary depending on the type of stairs you have. Most stairs have an overhang that protrudes out past the riser. This overhang needs to be cut off or wood needs to be added here to eliminate the space. When installing laminate flooring on stairs evaluating the cost should be one of the first items you need to investigate. Of course you need to know how much flooring it will take. If you are having your floors done also, don't forget to include flooring for the stairs. You have the option of installing the flooring on the riser or a painted board. 1 inch thick Poplar wood is the best choice for this. Poplar is better then pine, it has less knots and takes paint better. Measuring the stairs is simple. 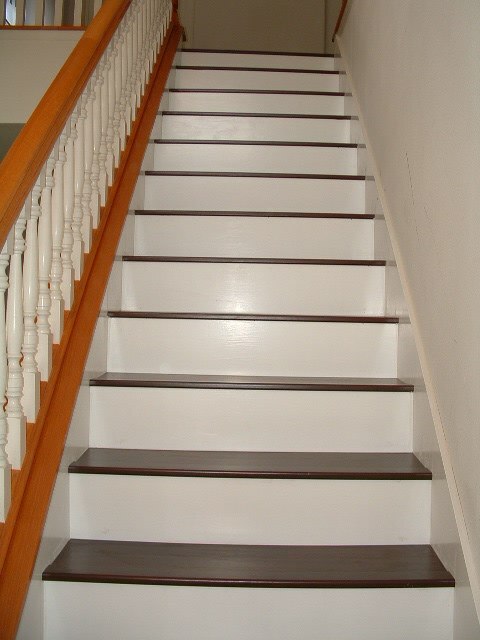 Typical stair treads are about 36 inches wide by about 10 to 12 inches deep. This tread will take 3 square feet. If you decide to install the flooring on the riser measure it the same as the tread. So figure 3 sq/ft for the riser also, which will be 6 sq/ft per stair. If you have 14 stairs 14 X 6 = 84 sq/ft. Add from 10% to 15% in case of mistakes. The length of the stair nose you order will determine how many you will need. Most stair noses come in 6'6" to 7'. Laminate stair nose transitions are pre-made at the factory so there aren't many options here. If at all possible you may want to order an extra stair nose just in case for mistakes. After you figure the materials you need we can move on to the next step. 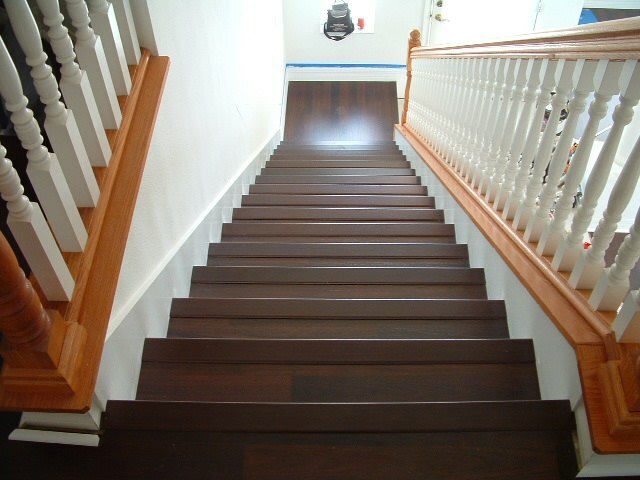 I have a particular order in which I install laminate or hardwood on stairs. I prefer to get most of the stair parts cut before I attach them. Before I can cut the riser I like to cut the tread so the riser will rest on the tread when I measure the riser. This means that I start at the bottom and work up. I have put the different steps in order below as this is the process I use. The one thing you could change is when you cut the stair nose. You can cut it before you attach the treads and risers or cut them after the treads and risers are attached. The first thing to do is to remove carpeting and check the stairs for squeaks and make sure the stairs are flat. If your stairs have an overhang this needs to be removed or the space below the overhang needs to be filled in. Cutting the laminate stair treads can be tedious and time consuming. When you get it right it can look like a professional did them. Cutting the risers will need to be done in such a way so they fit tight along the edges. I prefer to do them after the treads are cut so they will rest on the tread that will be installed there. In order to have the riser set flush on the tread below it may need to be scribed if the stair tread is not flat. Cutting the stair nose molding and getting it to sit level on the riser. After cutting the laminate stair treads I will explain how to install them in this next step. Now that the stair risers are cut to the proper size, I will explain how to install them in the next step. After cutting the stair nose to the right size the next step will be installing the stair nose. If you have anything to share about installing laminate flooring on stairs let us all know. Maybe you have a better or simpler way of doing something that could help others. Or you can upload some photos.